Believe it or not, there are a portion of hardened jailbroken users who tend to welcome in a new day by launching Cydia to see if any of their installed packages have updates, as well as browsing through the Changes section to see if anything new and noteworthy has been pushed to the repositories over night. It shouldn’t come as any great surprise to users that the majority of the new changes within Cydia are theme-related, with only the odd useful tweak or extension showing up these days. With that said, one small offering which has landed on the ModMyi repository in the last twenty four hours is a tweak which will perhaps appeal to quite a broad range of users. We are offering no prizes to readers who can guess what the DockHide tweak offers, but it is likely to be an installation which many will benefit from. DockHide comes from developer PathKiller29 and mimics the option that may be more familiar to Mac OS X users, allowing the docked icons to be hidden from the main view. Users of the iPhone, iPod touch, iPad or any computer running a version of Mac OS X will be familiar with the Dock, and the benefits which come with it. Being able to take a number of favorite apps and give them a permanent, quick launch home in the dock is definitely one of the defining features of iOS and Mac OS X. Other main OSs offer similar launch mechanisms, but the Dock has become synonymous with Apple products. Mac machines offer the user a number of configurable options when it comes to the Dock, mainly being able to choose where it shows up on the screen as well as being able to hide it from view as default, with it only being called upon when the user hovers over it with the mouse. Because of the screen size of iOS devices, the Dock can only be located in one place, the bottom of the screen. The DockHide tweak uses Activator methods to allow the user to quickly dismiss the Dock from view which could be invoked by tapping the status bar, holding the power button, swiping in from the bottom of the screen or one of the other numerous gestures included with Activator. When installed, DockHide has its own preferences panel which allows the user to define the activation method as well as determine whether or not the SpringBoard app icons should stretch in an attempt to fill the void left by the missing Dock. DockHide works very well and when invoked, the animation is smooth albeit a little fast for my liking. After using the tweak for a few minutes, a number of issues do become immediately visible. First of all, if the toggle to stretch the icons is set to On, the tweak seems to alter the view that the SpringBoard is contained in, allowing the app icons to be scrolled vertically as well as horizontally, meaning that some of them are occasionally lost off the top of the device’s screen. Additionally, when the Dock has been dismissed from view and a folder is opened, the empty dock image seems to make a brief reappearance which detracts from the overall experience of the tweak. 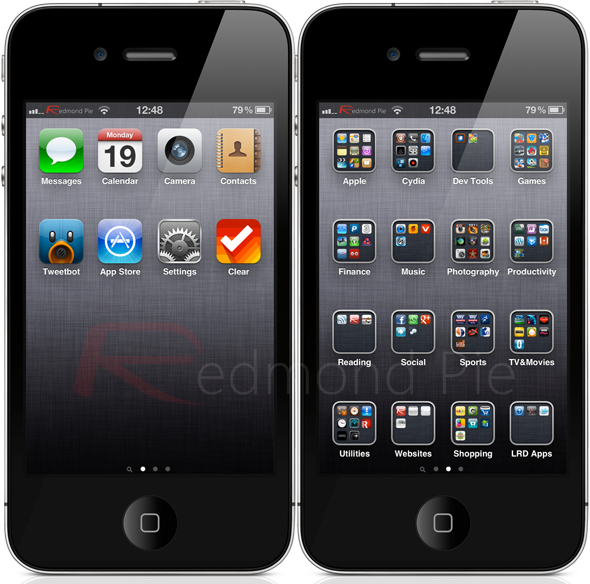 DockHide is available as a free of charge download from the ModMyi repository with the Cydia information making no reference to device or firmware requirements.